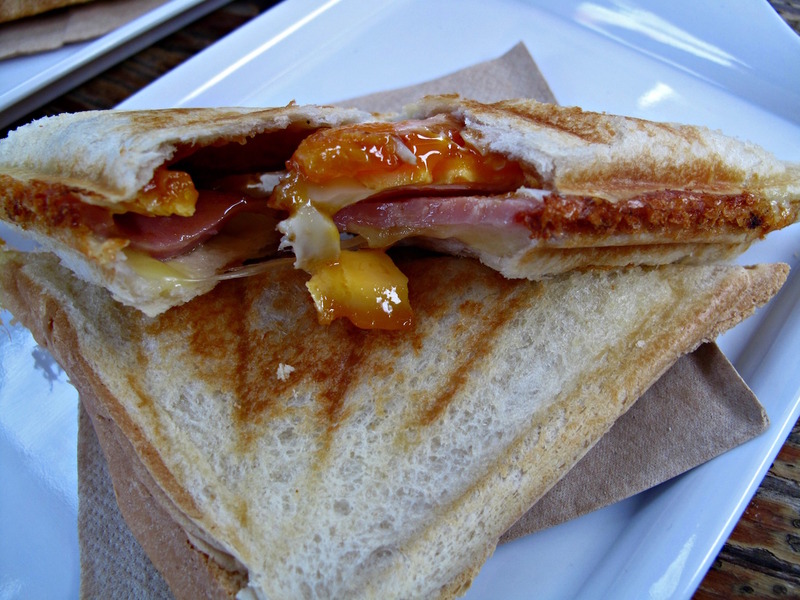 Roll up for jaffles? I’ll be in that! 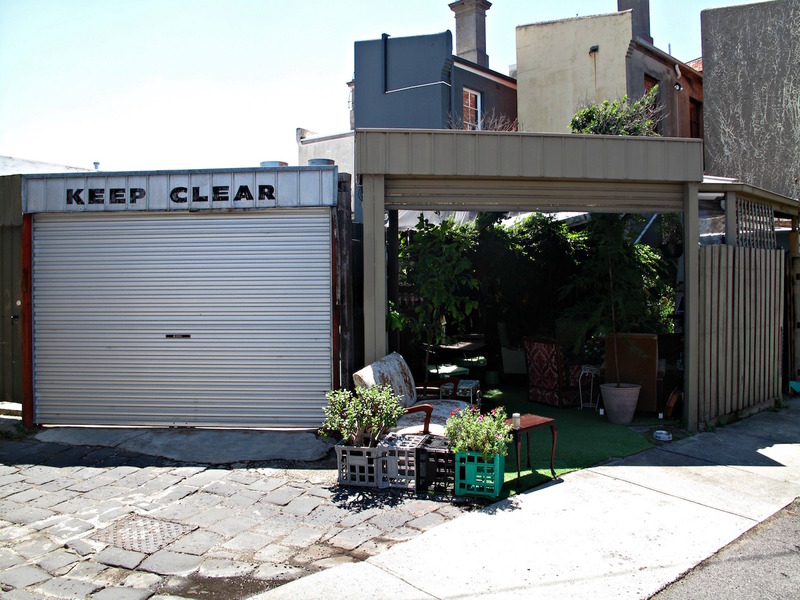 Down behind a Mount Alexander Road florist is a cool, green space just right for a chilled-out lunch on a sunny Saturday. It’s retro central – in the form of armchairs, sofas and more. 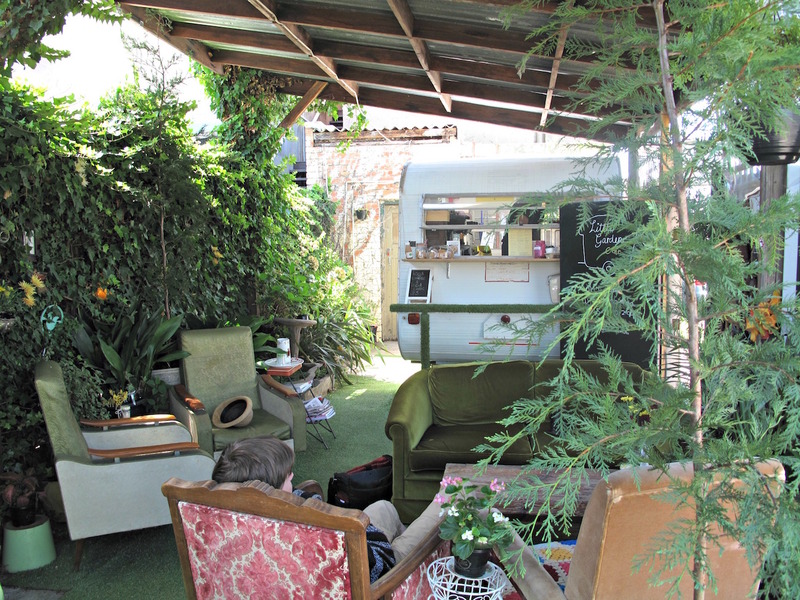 And retro, too, in the form of the kitchen and serving area, for which purposes a vintage caravan has been pressed into service. 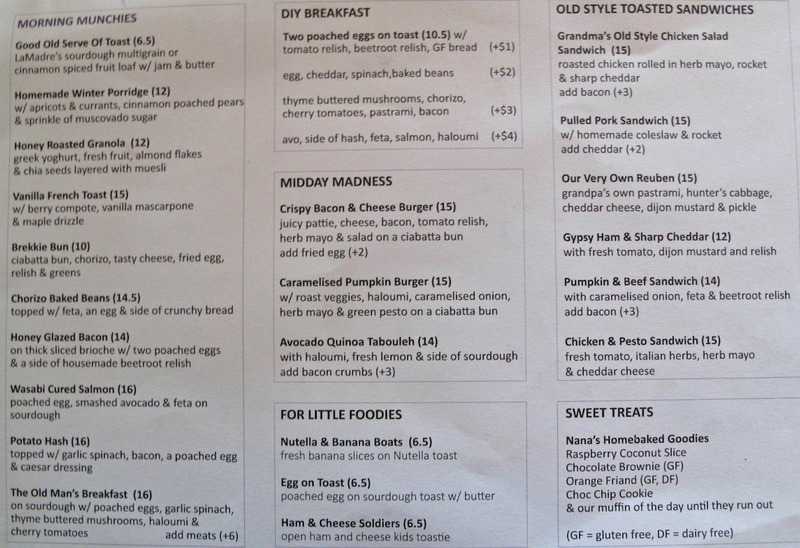 Given the tight space situation, it’s no surprise the food line-up is equally tight and also light (see menu below). That’s fine by us – on the way here we mused over possibilities such as Somalian, Chinese BBQ meats and dumplings but the truth is we’re just not THAT hungry. 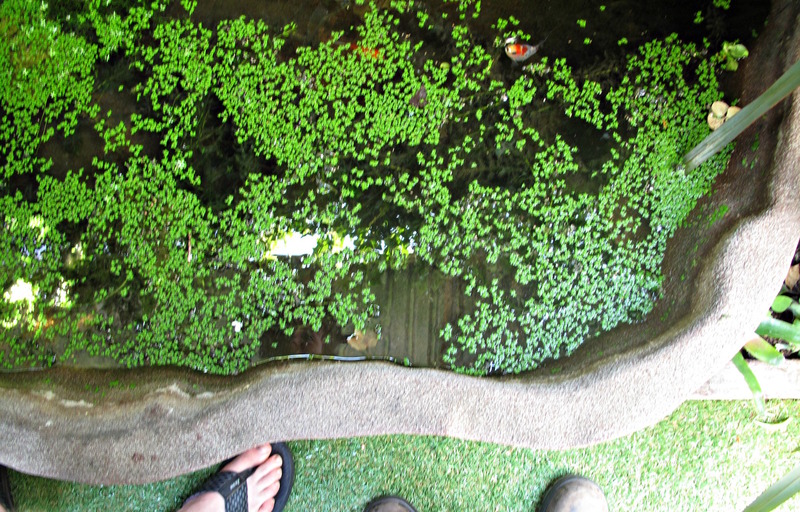 There’s goldfish in the house; we see two. 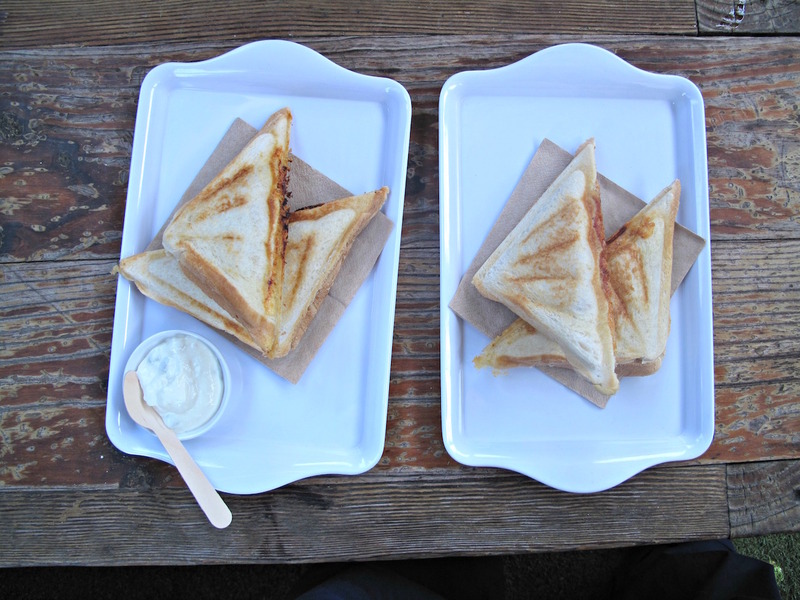 Our jaffles arrive looking pretty as a picture. Bennie adores his Doori Time! 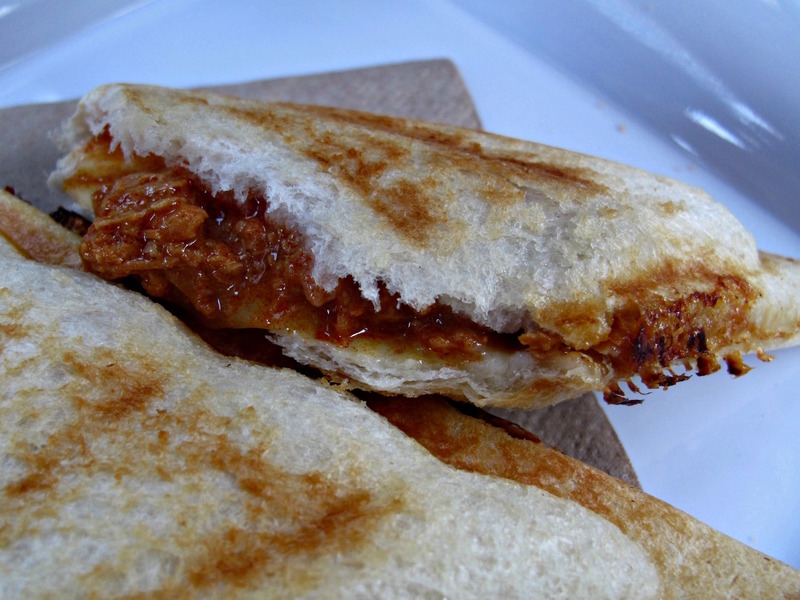 ($8.50) with its chicken and cheese swimmingly soaked in a delicious, piquant and dark sauce. It’s unclear if the shredded chook has spent any time in a tandoori oven but it matters not. 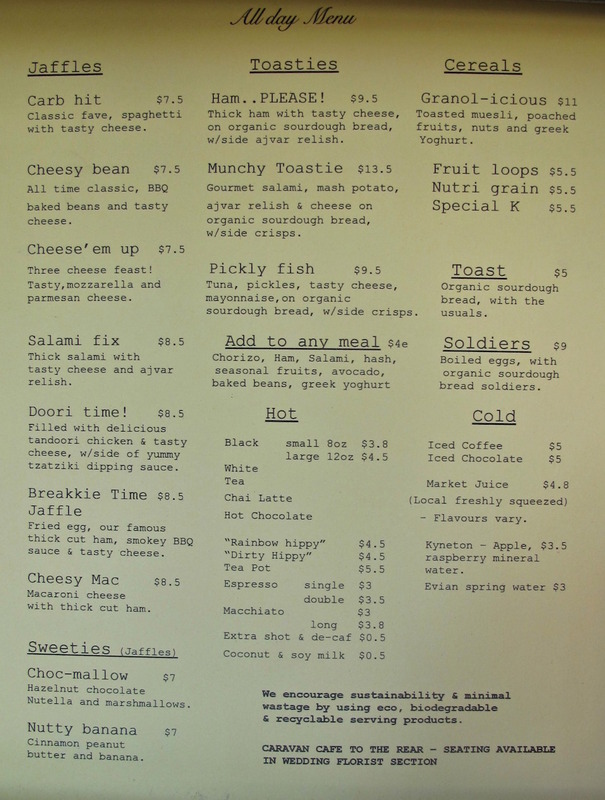 This jaffle comes with a pot of raita – nice touch, that. My Brekkie Time ($8.50) is good, too, though doesn’t have quite the same sort of flavour hit. The ham is indeed cut thickly and it works fine with the egg and sauce. Our matching $3.80 cafe lattes are spot on. It’s worth signing up to the Little garden Cafe Facebook page, wherein specials such as a Beefy Slaw sanger of “succulent bbq pulled beef, creamy housemade slaw, mozzarella cheese, toasted on organic sourdough” are regularly listed. The longer Consider The Sauce lives in the west, the more delightful are surprises we stumble upon of people and places that have been there all along. 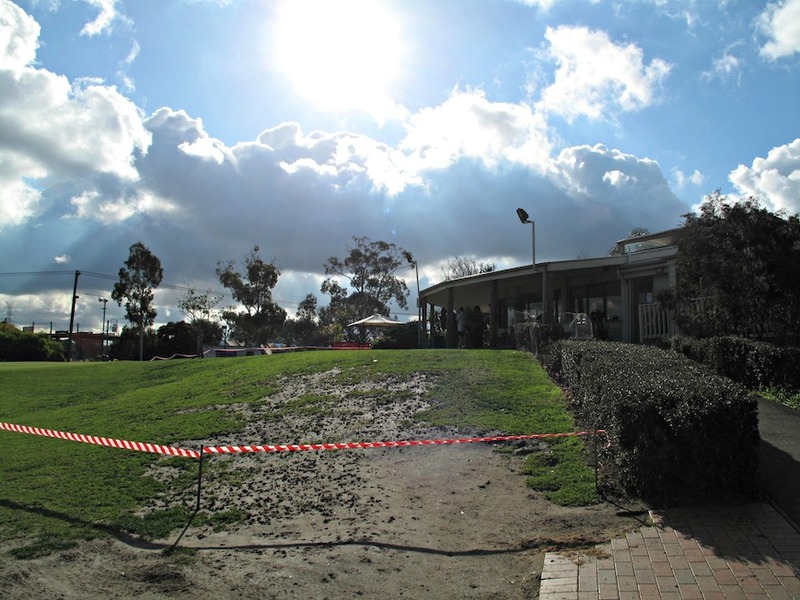 Like Medway Golf Club, Riverside Golf and Tennis Club is tucked away beside the Maribyrnong River in a way that seems almost designed to evade casual discovery. Even better – much, much better – the catering and food affairs at Riverside go way beyond what may be expected at a golf club. 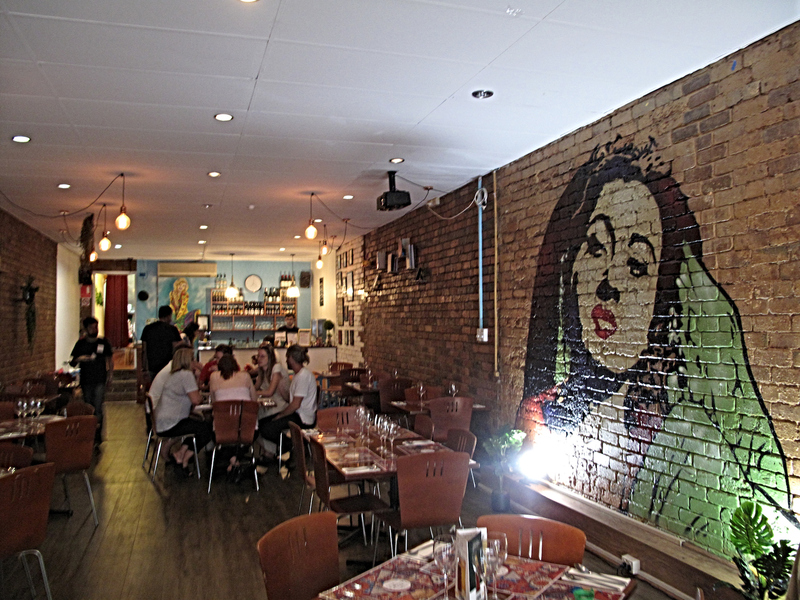 I’m told that for at least a couple of years, Riverside Kitchen & Events has been running here, delivering the food and service of a traditional, old-school Italian restaurant. 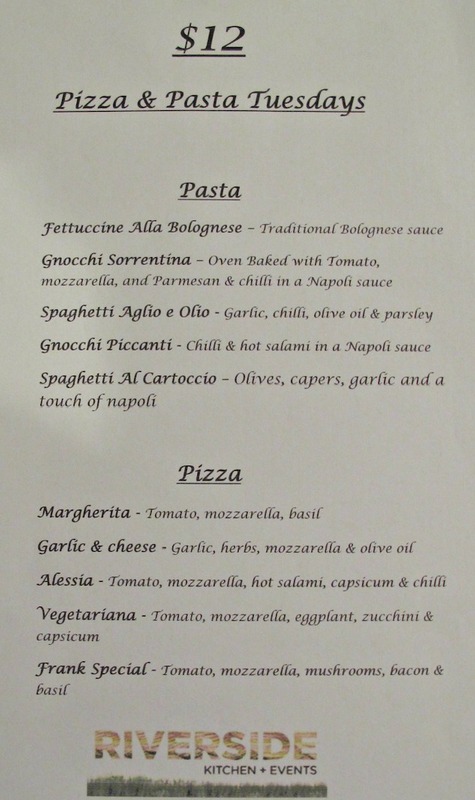 You can check out the full Riverside menu here but tonight the four of us are here to take the place for a spin in the form of the Tuesday’s $12 pizza and pasta specials (see menu below). 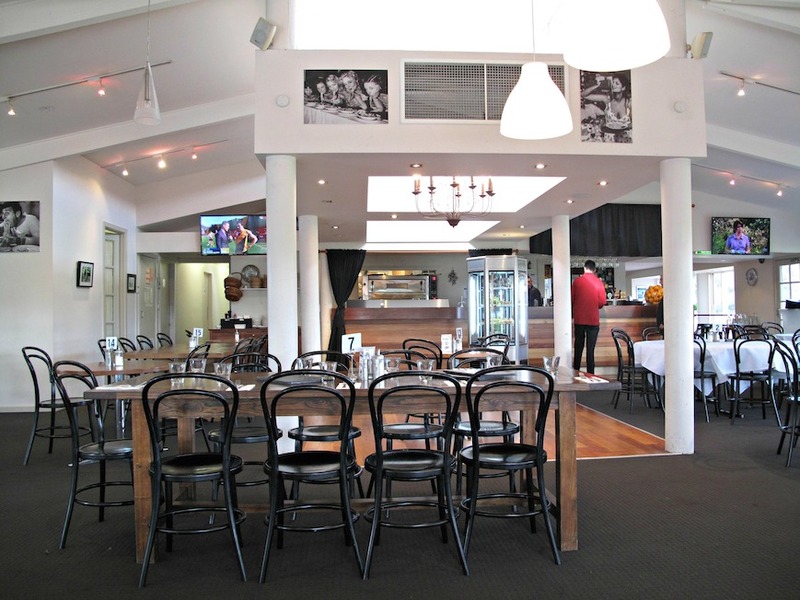 The place does has an attractive clubbishness that is not unexpected – it’s a cool place to spend some time and must be a true delight for a sunny summer lunch or early evening weekend dinner. On a “research” visit a few days previously, I’d spied house-made zippoli, tiramisu and canoli! The $12 Tuesday menu is a restricted selection of the menu proper’s pizza and pasta line-up – no surprise the five of each evince no presence of seafood, but that’s fine by us. 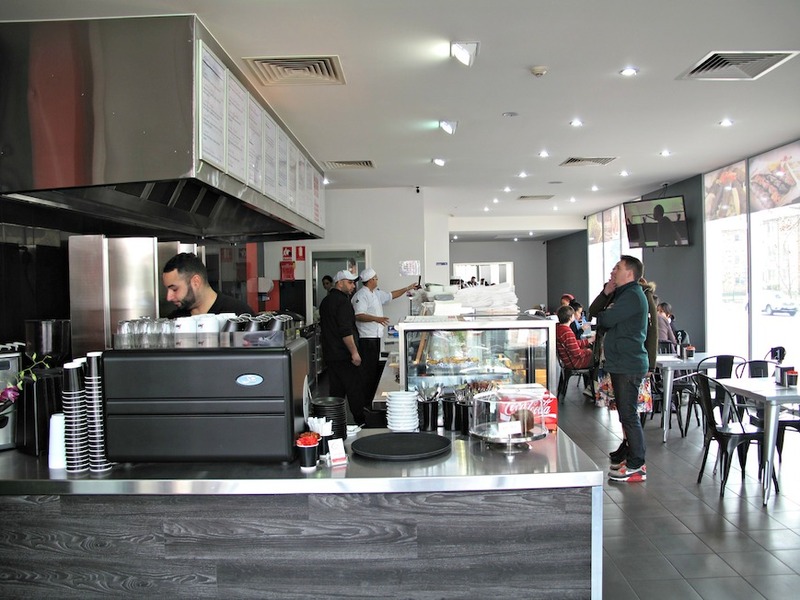 The food we enjoy is the real deal and of much better quality than we’d find at a similarly priced theme night at, say, a pokie venue or the like. Only one of we four goes for a pizza. The Frank Special has mushies, bacon, basil, tomato and mozzarella. At first we cynically start to think the pie is adorned with the dreaded “pizza ham” – but no, this is real bacon and it makes all the difference. 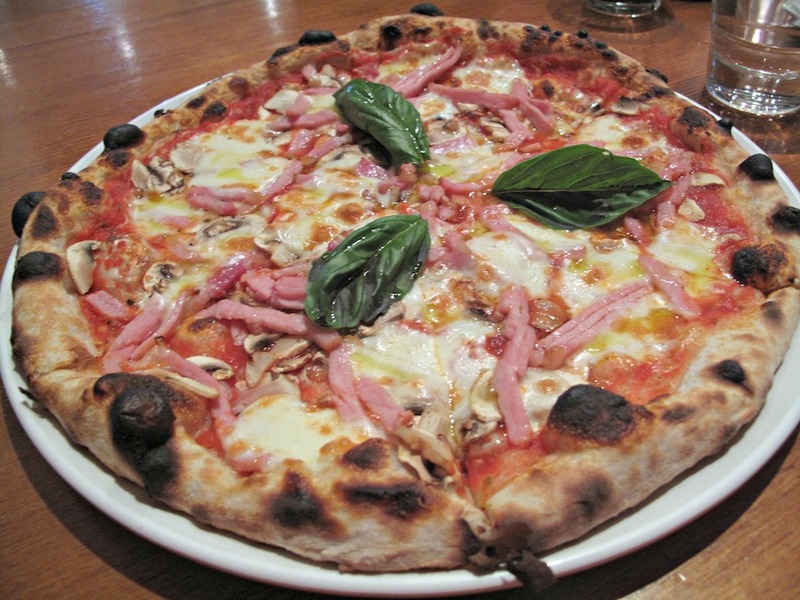 This is a good pizza, period. 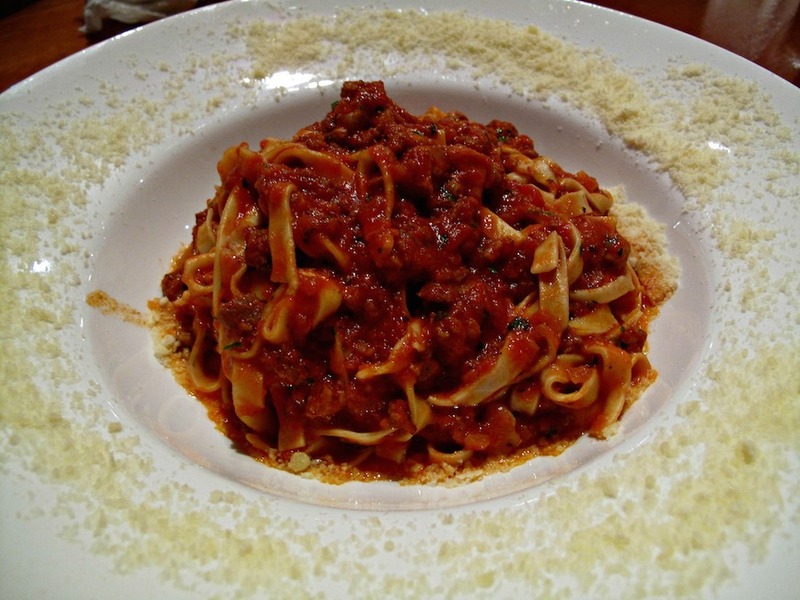 My fettuccine alla bolognese is simple but very enjoyable. The rich sauce appears to have been made with real meat rather than brought-in mince and the noodles have the sort of suppleness that speaks of made-in-the-kitchen pasta. We’re assured that all the Riverside pasta is created thusly! 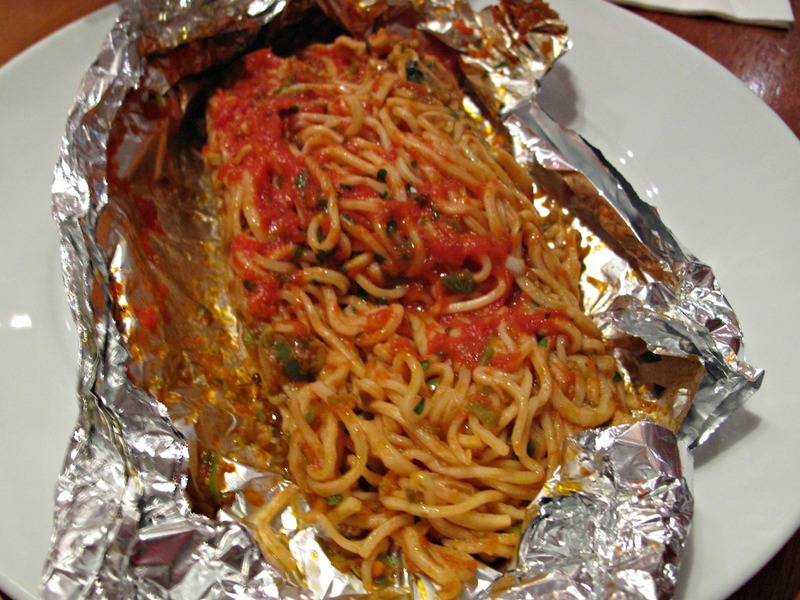 The pasta that comes with the spaghetti al cartoccio is likewise of fine quality. The parcel’s contents are alive with the flavours of capers, garlic and olives. This dish tastes and eats a whole lot better than it photographs. And, as with all three of our pasta choices, the portion size is big. 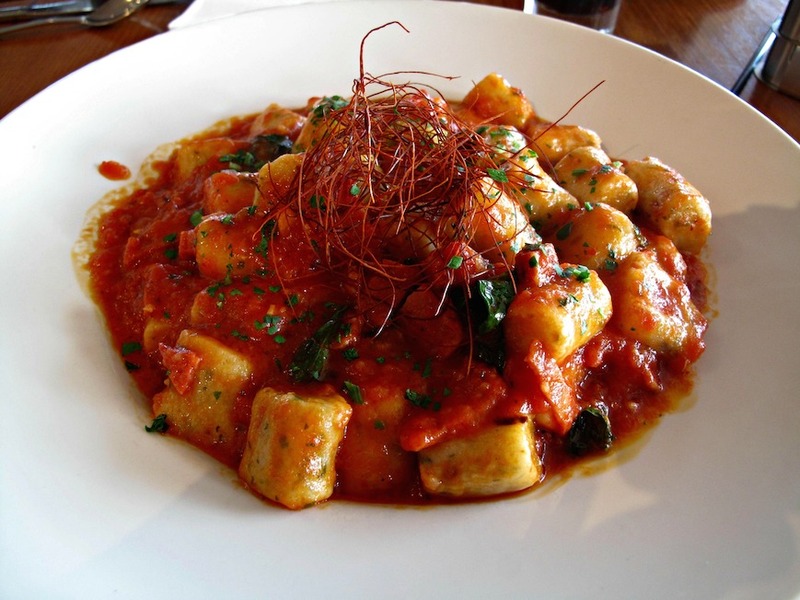 Bennie’s gnocchi piccanti has good but quite heavy pasta pillows bathing in a rich tomato sauce with chilli and hot salami. He’s a little underwhelmed but it tastes fine to me and is quite spicy. 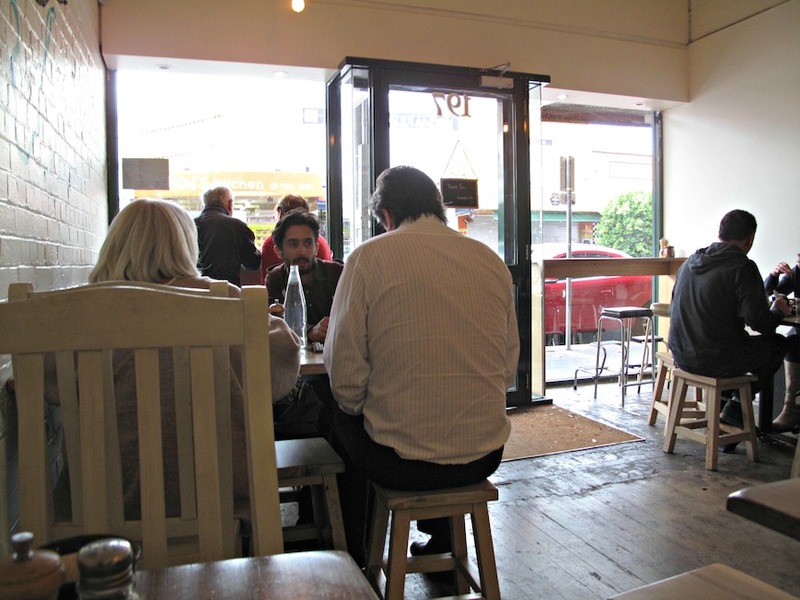 After a business coffee in Ascot vale, I’d planned on a Williamstown lunch. But honestly, after our fruitful and enjoyable meeting is over, it feels like quite enough work on my day off – if you follow me. I know there must be somewhere right nearby that will do. 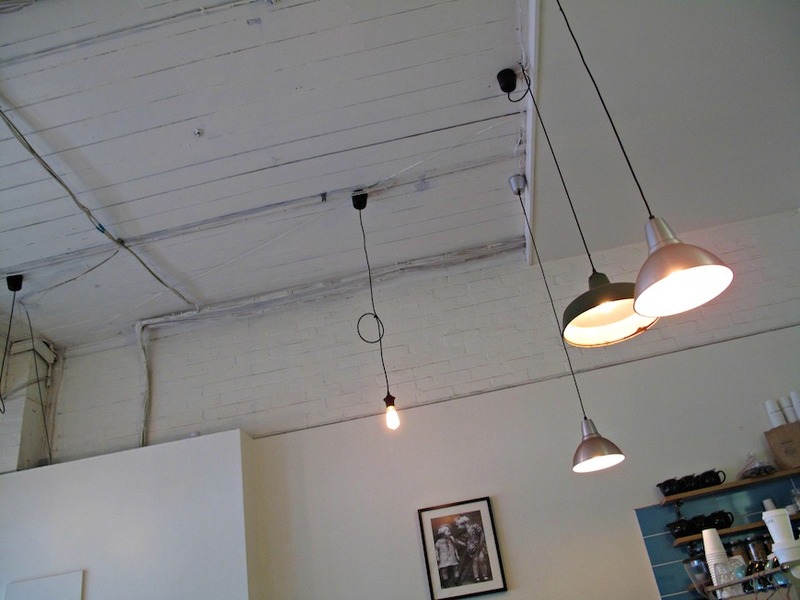 A revered (by us) place we reckon is one of the very best eating houses in Melbourne is right next door to our coffee spot – but I don’t feel like anything quite so filling. 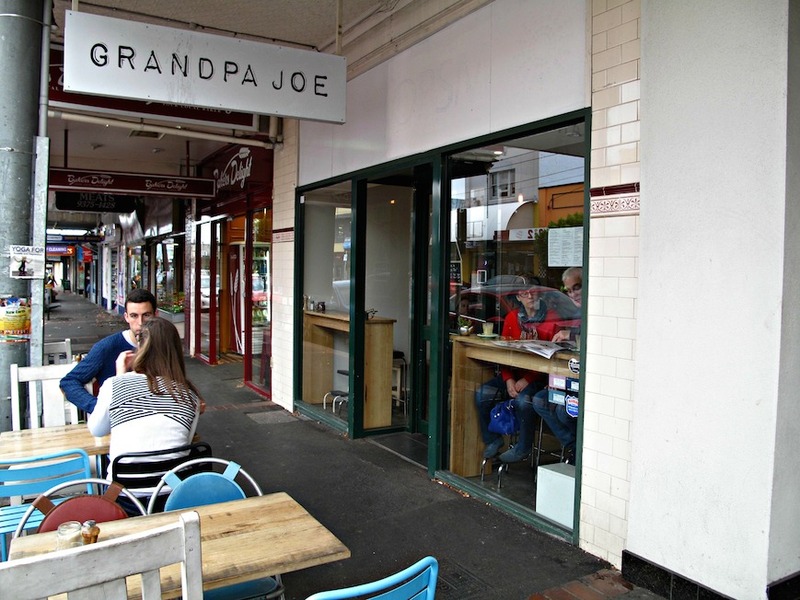 Ah, yes – Grandpa Joe, at 197 Union Road, will do just nicely. 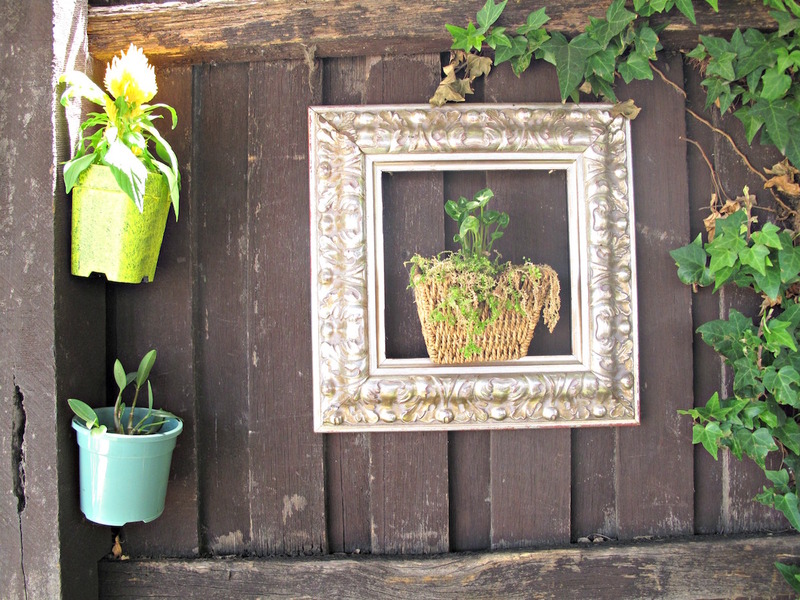 The place is small and welcoming. It’s done out in old wood and pale wood, with the classic old ceiling left intact. Observing the customers and their inter-action with the staff, it’s reassuring this seems to be a favoured local hang-out. 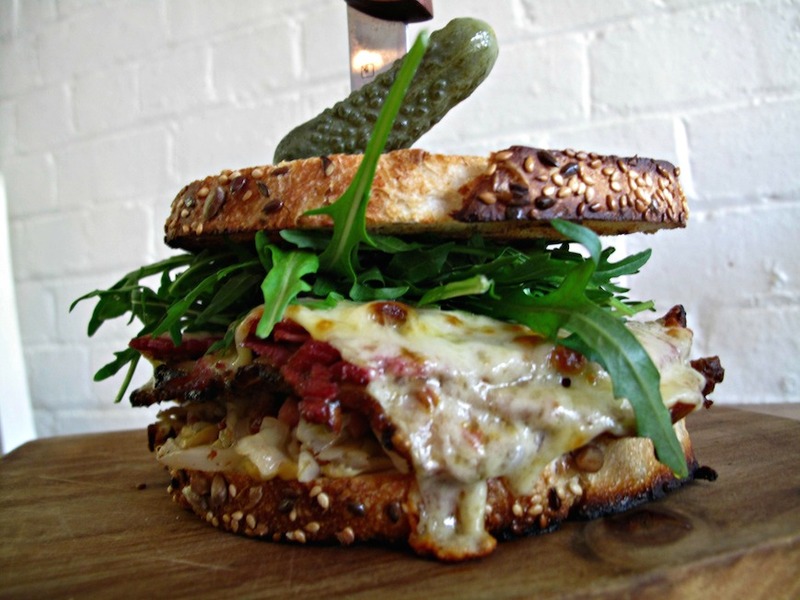 I’m very interested to see if a place that isn’t one of the new-style places that specialises in American food, and sandwiches in particular, goes with a $15 reuben. It looks a little on the small size but eats big. Purists beware – there’s rocket. But the corned beef is thick–sliced, very tasty and plentiful enough. The cheese is melted and there’s “hunter’s cabbage” aplenty. I like it that a fine not-too-sweet pickled cucumber is skewered on the knife that skewers my sandwich. After a happy first-up visit to Saj, I was always keen for a prompt return. Mostly to see if I could talk the staff into serving their marinated, skewered meats on a plate with accessories – my preferred option and delight. 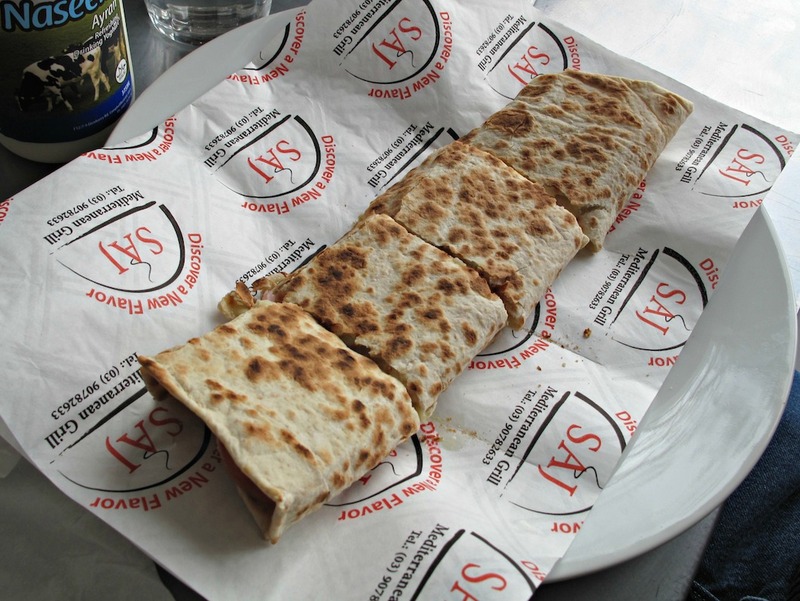 Perusal of their menu – which can be seen in the story of that debut visit here – seemed to have the meats only available in wrap form. 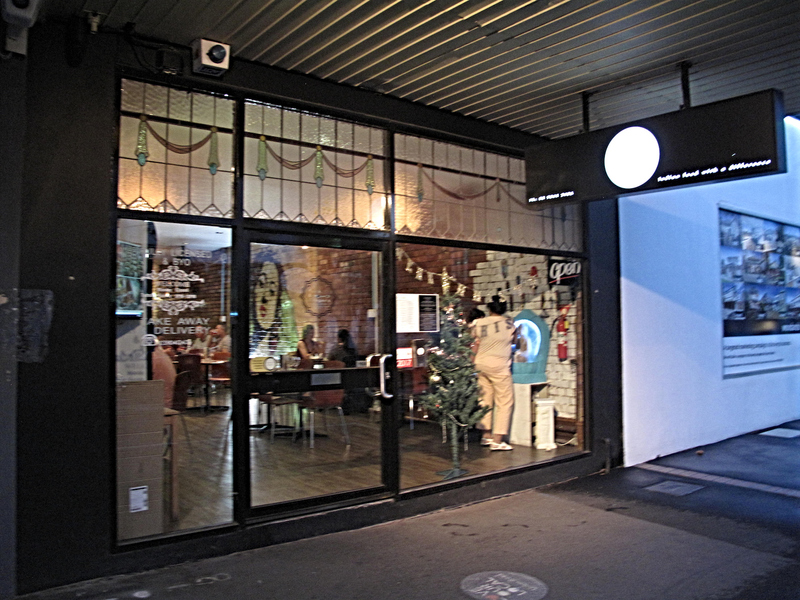 As luck would have it, a return visit comes to be much more quickly than I had foreseen – five minutes after Nat Stockley and I arrange a quickie impromptu dinner, I’m in the car and headed for Ascot Vale. And as it turns out, Nat’s eyes prove a lot sharper than mine – what I want is right there on the menu, he points out, under the heading of “Eat in deals”. 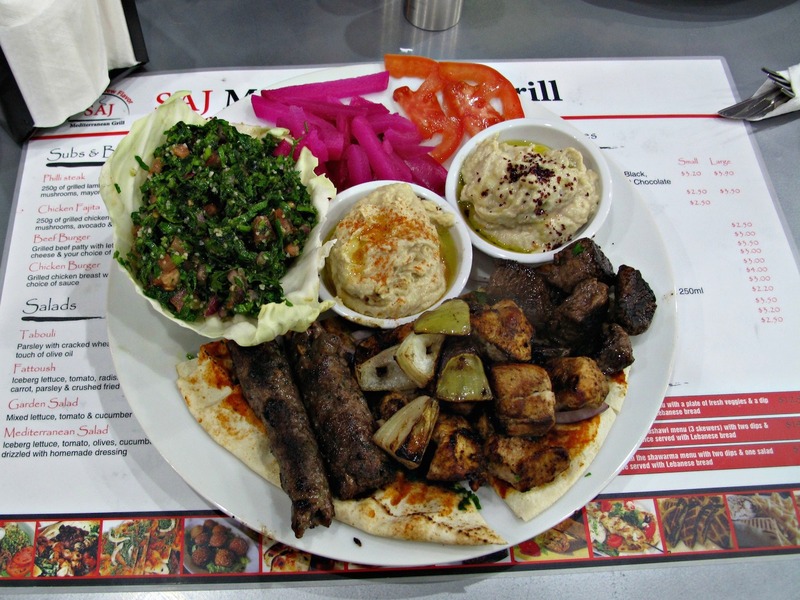 This is the sort of Lebanese platter I have been yearning for, and wanting in the west, for years. 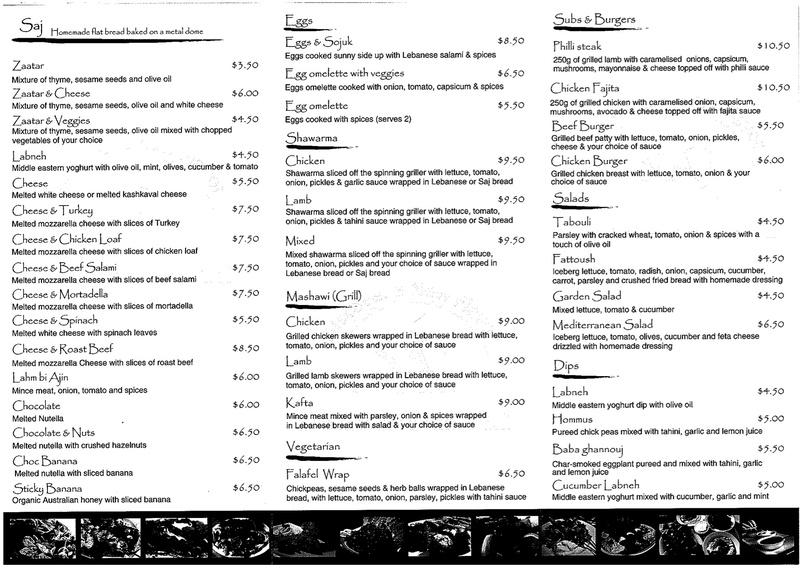 We both order identical $14.50 plates with one skewer each of lamb, chicken and kofta. 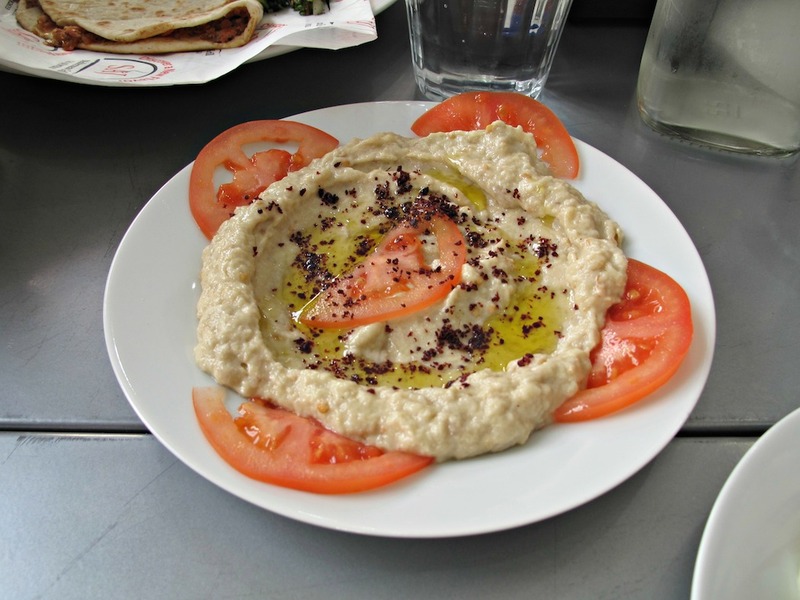 The hommus and baba ghannouj are as on that first visit – excellent. 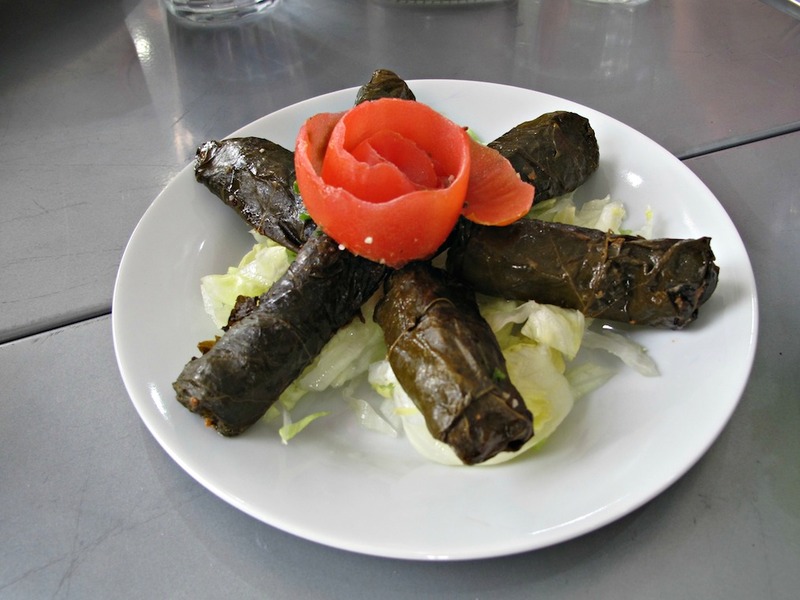 So is the tabouli, our plates graced with quite large serves of it in cabbage leave cups. A special word of praise for this Saj salad effort – not only is it sublimely moist and lemony, it also includes the all-important fresh mint, something often omitted from eatery versions. The meats are fine, especially the nicely seasoned kofta. We both reckon, though, the meats have all spent about a couple of minutes too long on the grill, the lamb cubes in particular being overcooked – not to the point of being unenjoyable, mind you. We mention this to the staff as we are paying and leaving, and are told of one customer earlier in the day who expressed distaste for having her lamb pieces “pink in the middle”. So CTS advises open and frank meat discourse with the Saj folks! 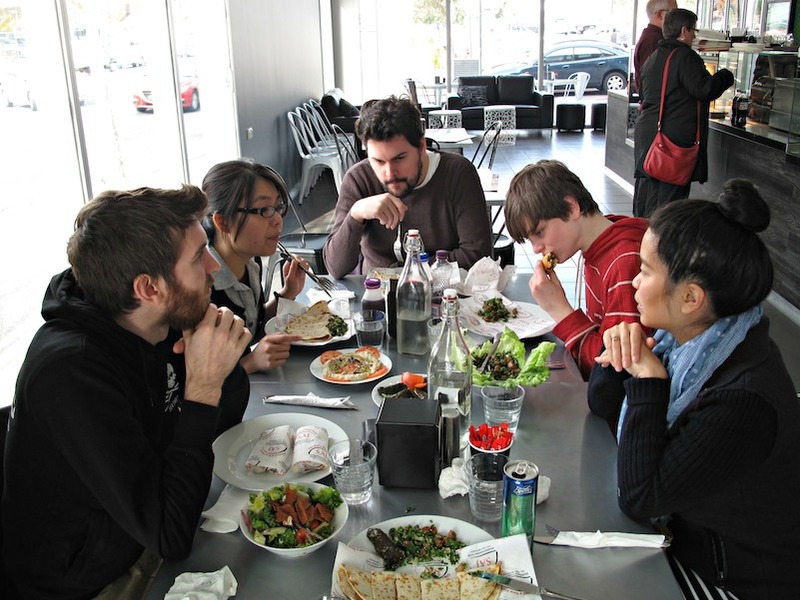 Many thanks to Josh, Christine, Julian, You Know Who and Eliza for helping CTS check out the west’s new Lebanese eatery! 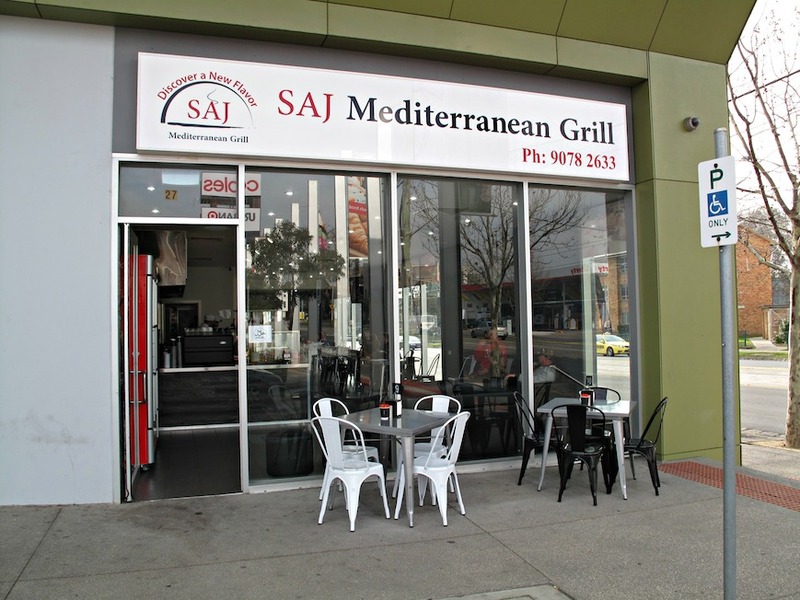 Saj Mediterranean Grill replaces a short-lived Turkish establishment in the showgrounds’ shopping precinct, which has never held much allure for us. It’s a terrific new arrival – and Consider The Sauce makes the most of our first visit by rocking up with a nice bunch of our regular dining companions. 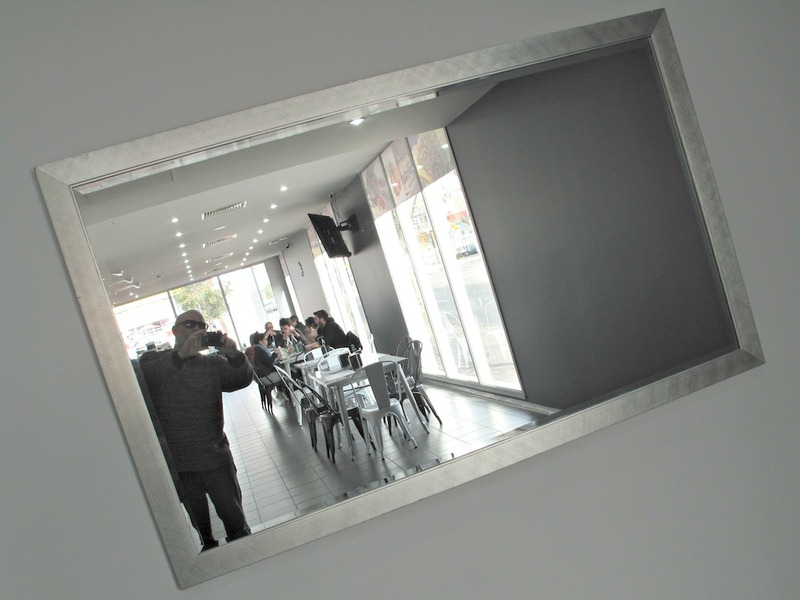 It’s done out in stark fast-food style, but the food on offer – see menu below – goes quite a bit further than the bakeries our western Lebanese experiences have thus far been restricted to. We get real plates and cutlery – and cheerful service. 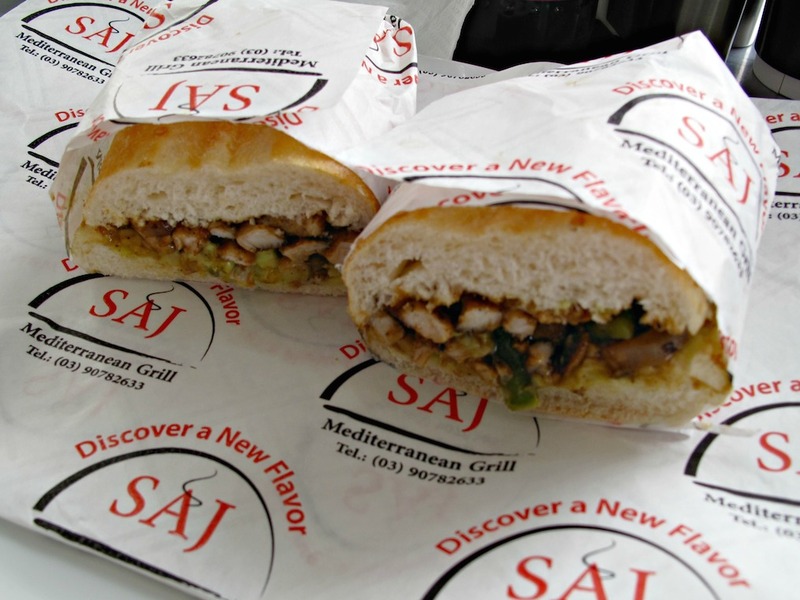 Saj is named after the saj grills, rounded dome plates used to grill the flatbread. CTS has only ever seen these before at this Coburg institution. 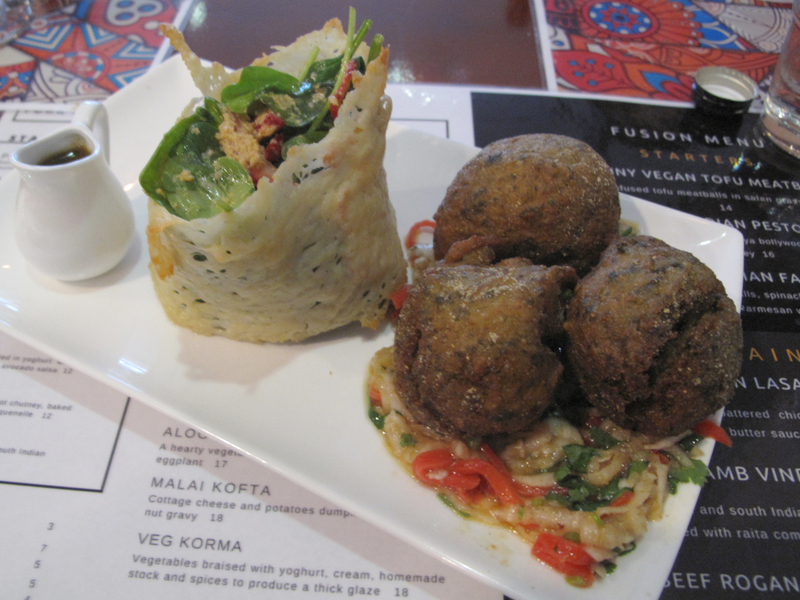 Between us all, we try a good-sized chunk of the menu – but without any intent to do so, we mostly veer away from the more substantial sharwarma and mashawi (grill) wraps. 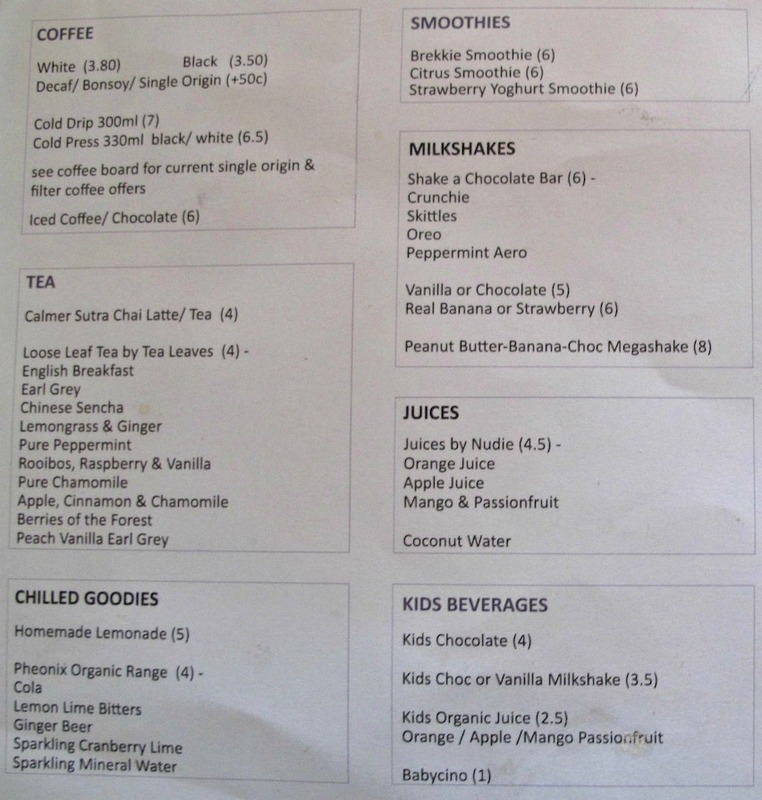 Even Bennie – given complete freedom to order whatever he pleases (i.e. hamburger) – dines elsewhere. 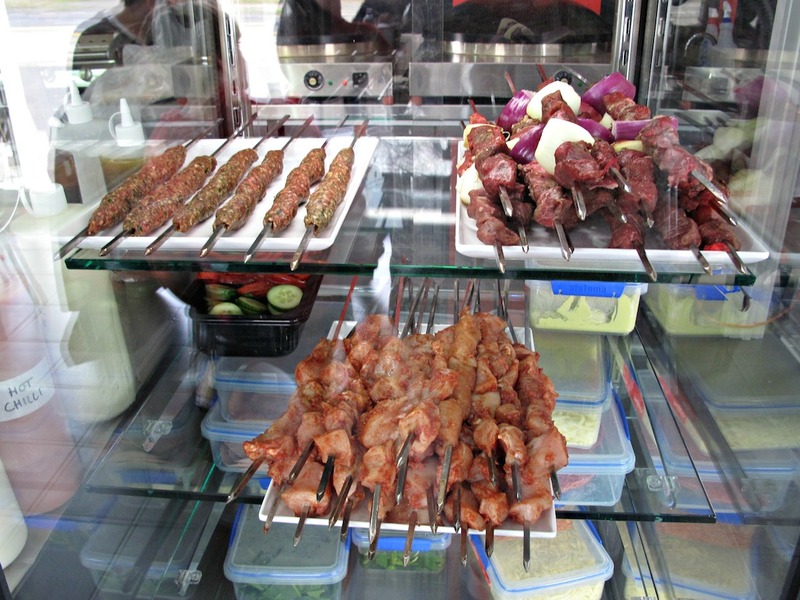 The skewered meats in the display cabinet look the goods but will have await a follow-up visit. What we have ranges from good to very good and we’re all very impressed. 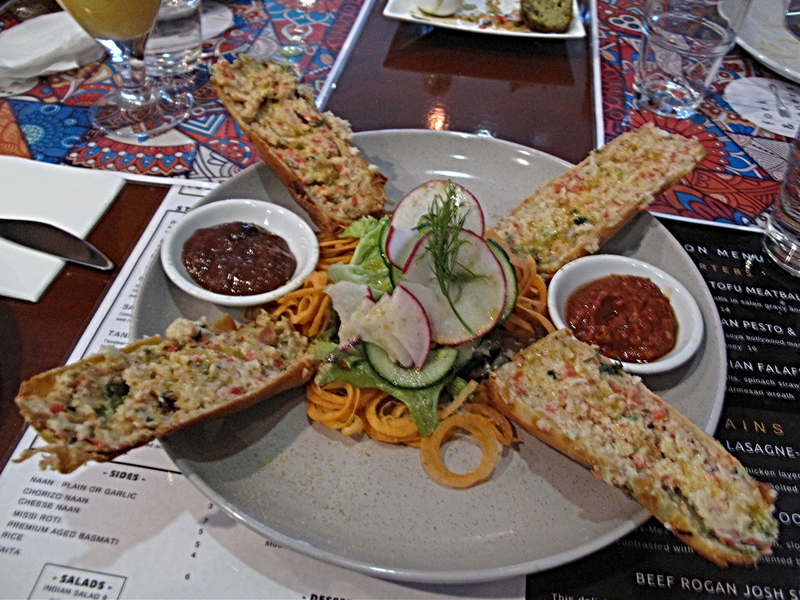 Having a new Lebanese eatery in the neighbourhood is a clicking-heels event around here! Beyond basic descriptions and prices, my assessments and comments are to do with those dishes I personally taste. 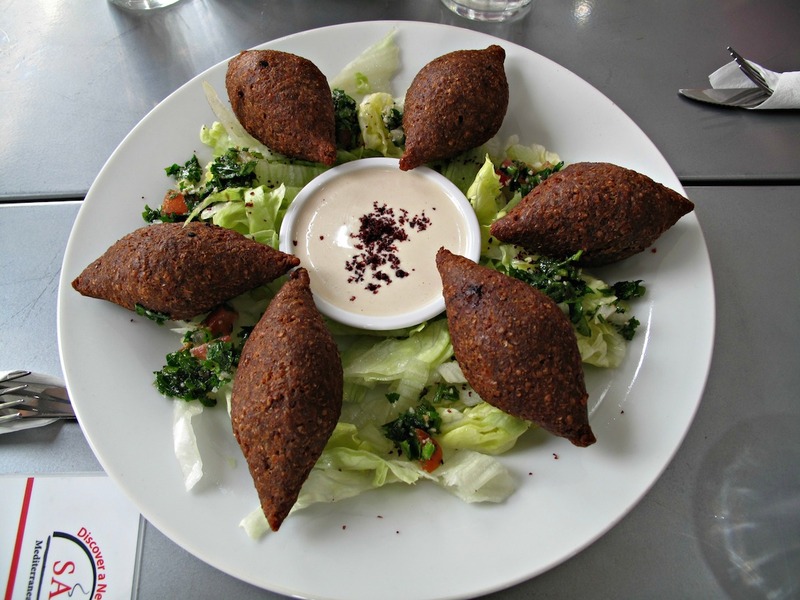 Kibbeh ($2) are hot, a little bit spicy, juicy and very fine. Some of my companions find pine nuts, but not so I.
Warak-arreesh (stuffed vine leaves, $1.50 each) are smallish, plain and just right. 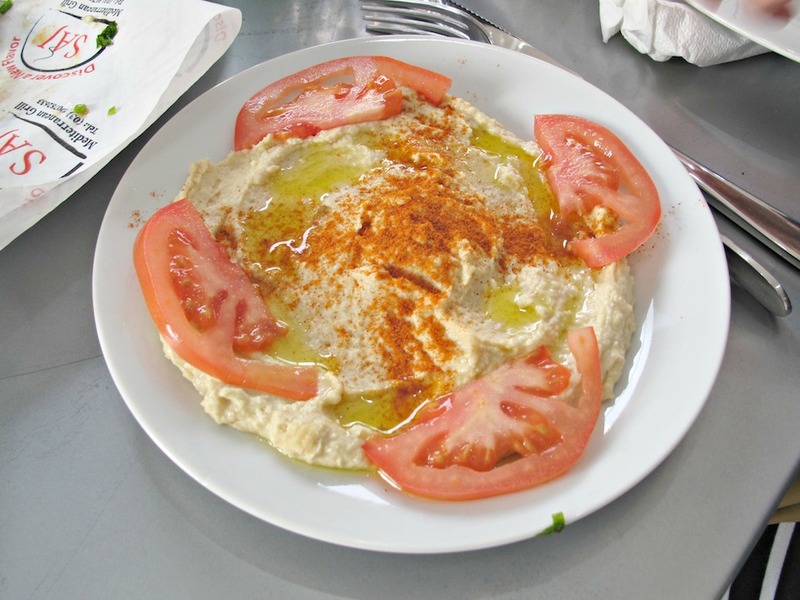 Hommus ($5) is fresh and smooth but of only mildish taste. 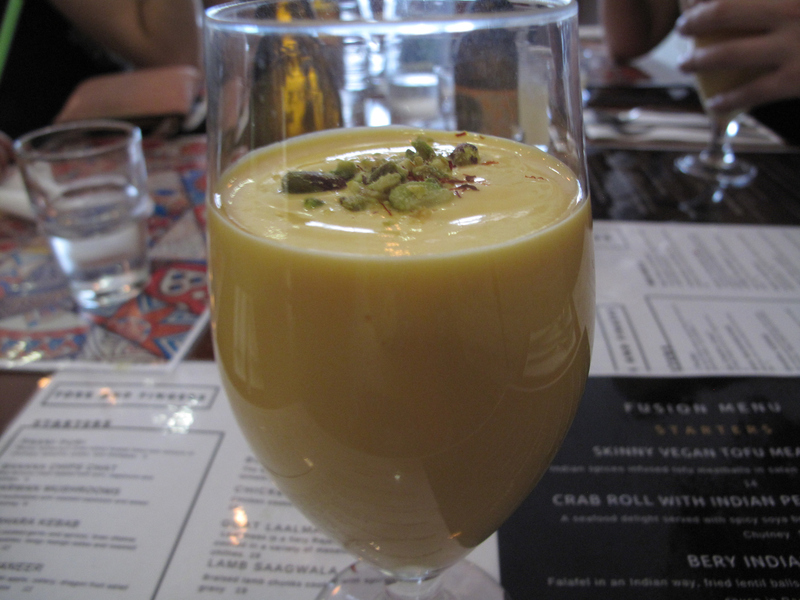 Baba ghannouj ($5.50) is fantastic – it hasn’t got that prized smokiness but it IS fresh, lemony and full of eggplant flavour. 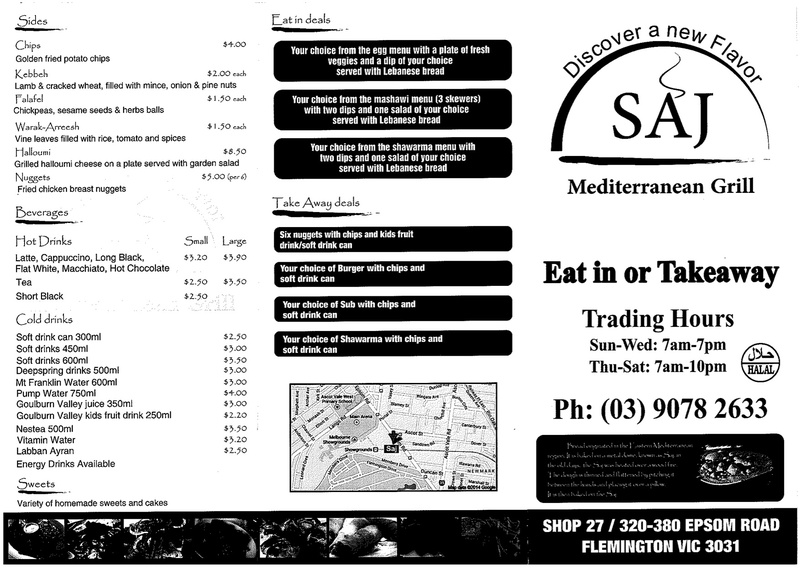 Both dips are served with the same flatbread used to make the saj pizzas, and more of it is brought to our table without being requested. 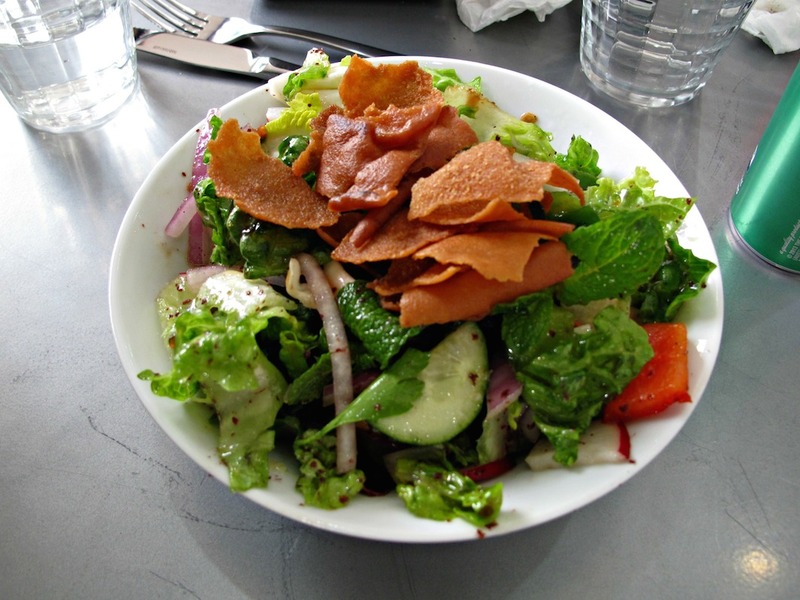 Everything here is fresh-as – including this fattoush ($4.50), its joyful jumble of veggies beautifully dressed and anointed with crisp, fried bread. 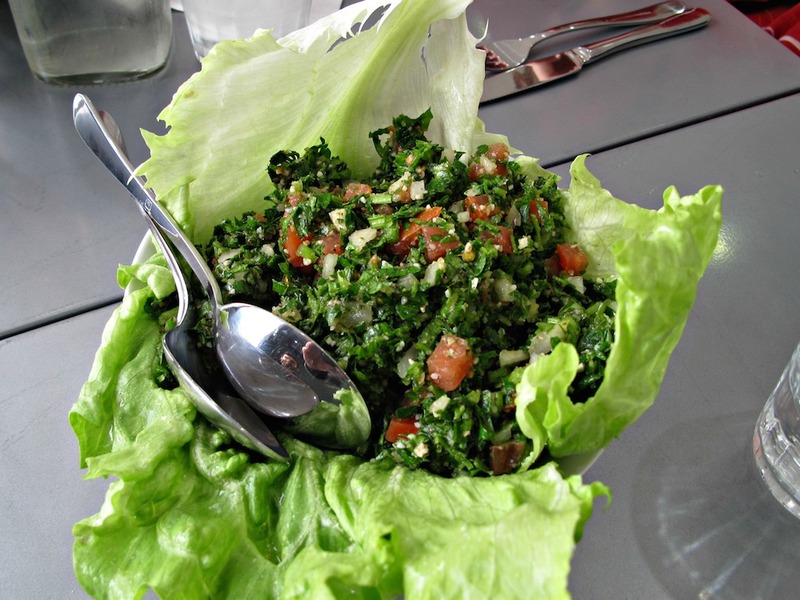 The tabouli ($4.50) is just as CTS likes it – wet and lemony. It’s a generous serve for the price, too. 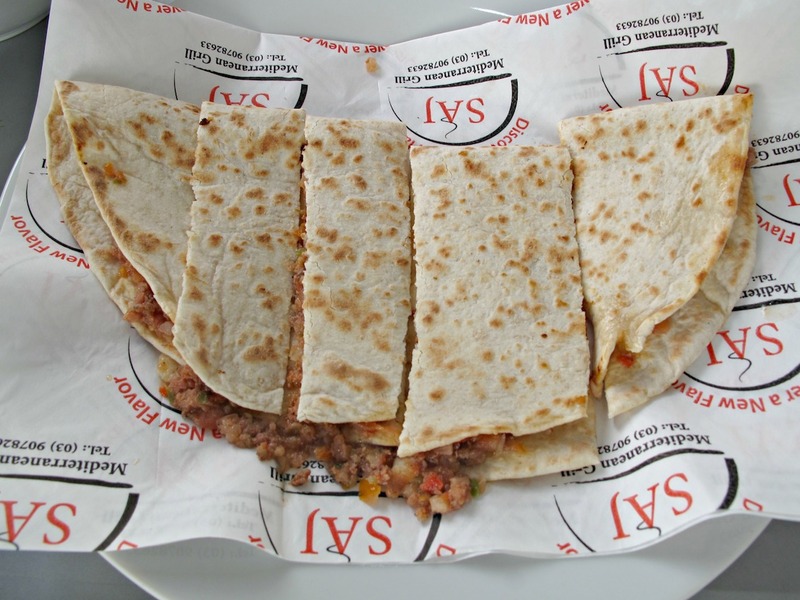 The cheese and turkey saj costs $7.50. Bennie describes his chicken fajita sanger ($10.50) with chook, caramelised onion, capsicum, mushrooms, avocado and cheese with “fajita sauce” as “nice”. 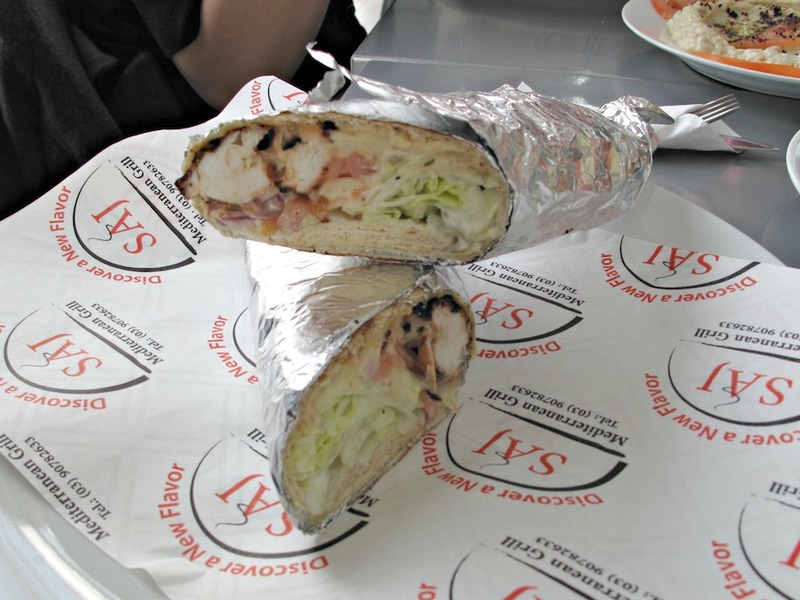 The chicken mashawi ($9) is skewered chicken with lettuce, tomato, onion, pickles and sauce. 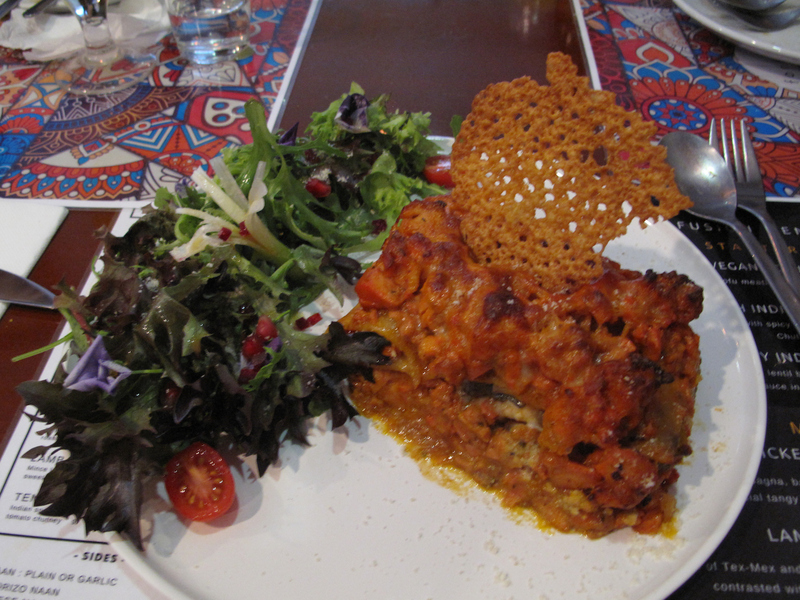 A couple of us order the lahm bi ajin ($6) – saj of “mince meat, onion, tomato and spices”. It’s nice enough but turns out the description is rather more lavish than what is pretty much the stock-standard “meat” pizza we get at other bakeries. 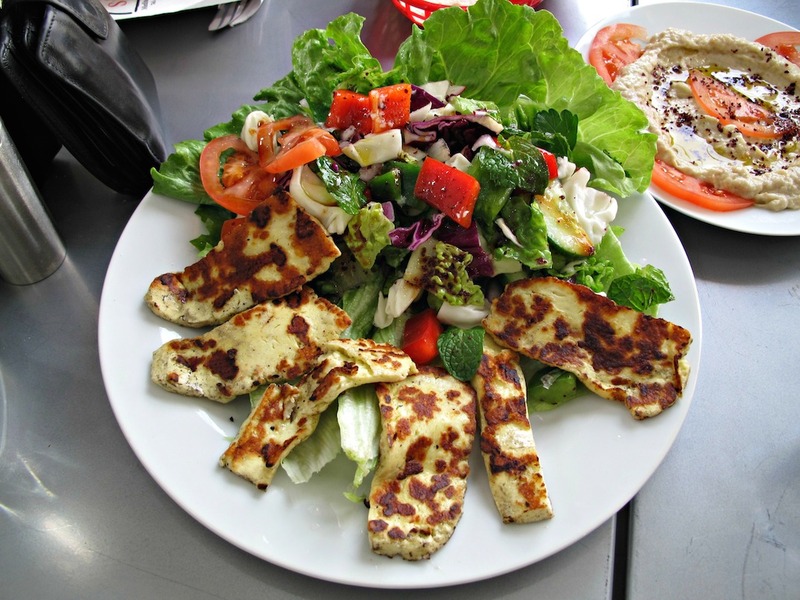 Mediterranean salad ($6.50) has the same fresh vegetables seen elsewhere with wonderfully chewy, salty chunks of grilled haloumi. 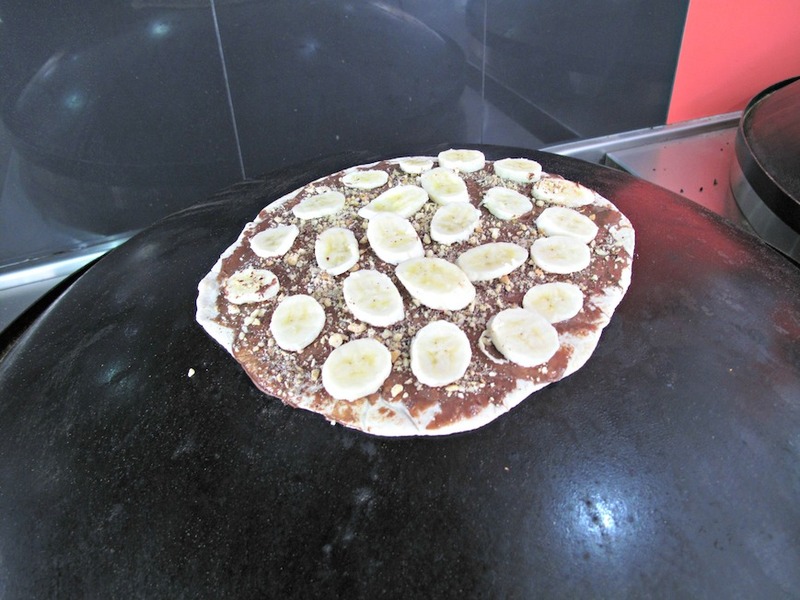 We finish off with a couple of choc banana sajs ($6.50) – a sweet delight with nutty extras! We’re already looking forward to our next visit. How can this place not be a hit? At first blush it would be easy to conclude the arrival of Hon’s Kitchen on Union Road is merely a case of one nondescript, generic noodle bar replacing another. 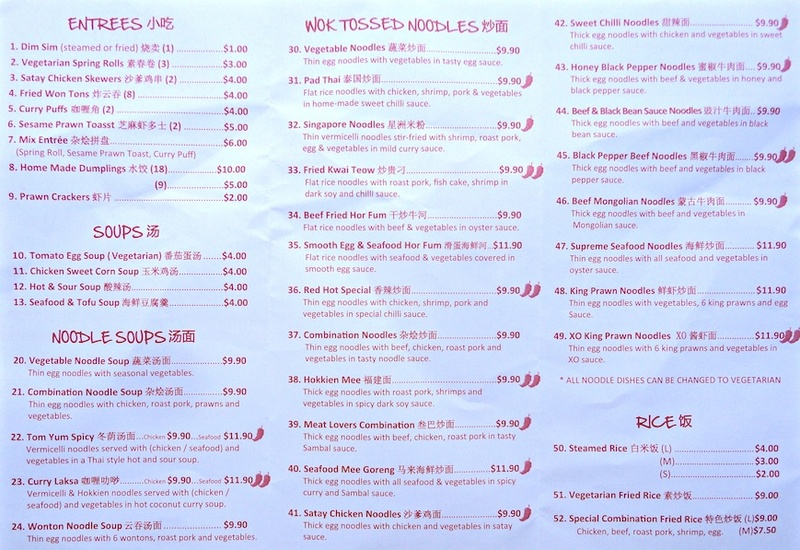 But a solo visit by yours truly – during which a rather fine beef noodle soup, a bit like pho but without the more pronounced seasoning in the broth, was enjoyed – has us thinking Hon’s Kitchen has hidden depths and riches. 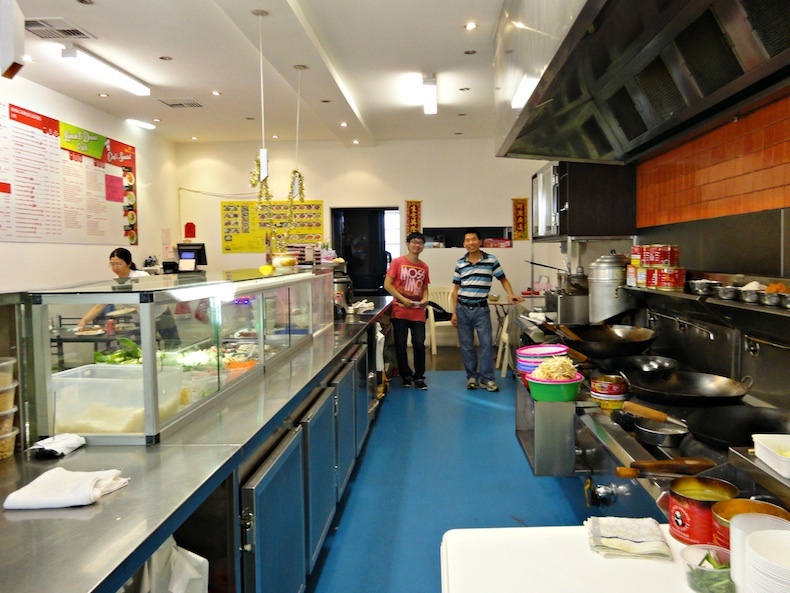 Specifically, we have hunch that while black bean beef or sweet ‘n’ sour whatever may be the stock in trade here, careful menu selection may result in the sort of wonderful, top-class yet affordable Cantonese tucker we get from Dragon Express. We love following our hunches – especially when they come good as spectacularly as they do tonight. 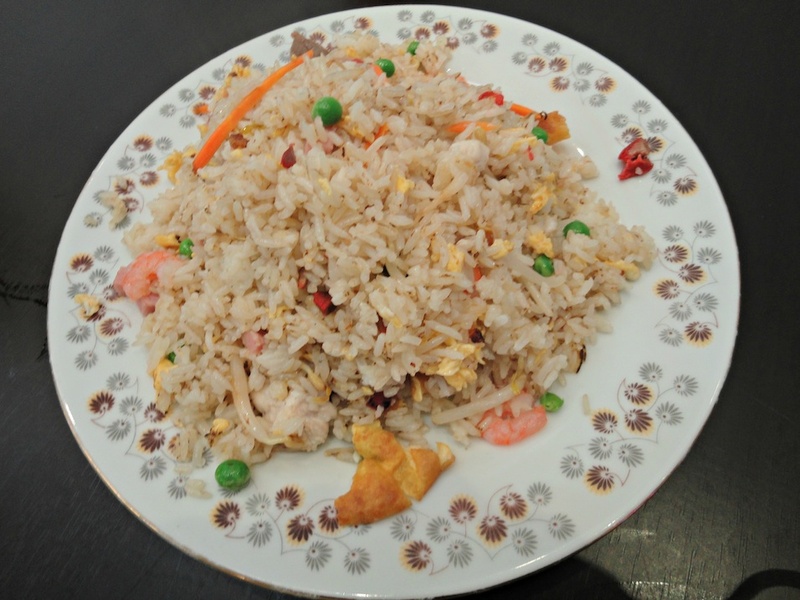 Special combination fried rice ($9) is good. But really, considering the richnes of our other choices, we should have gone with the identically-priced vego version or just plain rice. 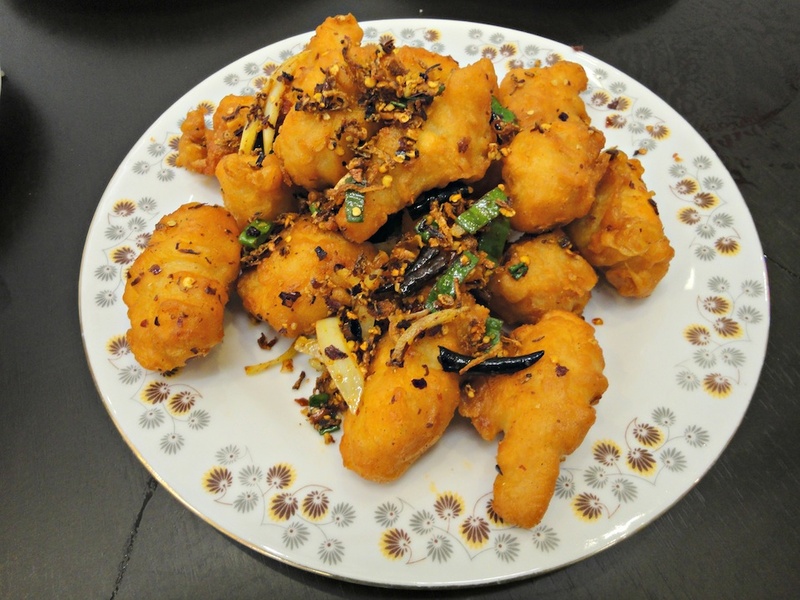 Spicy chicken ($12.90) … truly superb! Unlike versions we’ve had elsewhere that involve ribbettes and their bones, this dish is built around boneless chicken pieces deep-fried, with the resulting globules being delicious and marvellously crisp and dry. Of course, the real prize here is the spicy, dry jumble of goodies that accompanies. This includes three types of onion – crunchy brown fried shallots, green onion discs and slivers of fresh white onion. 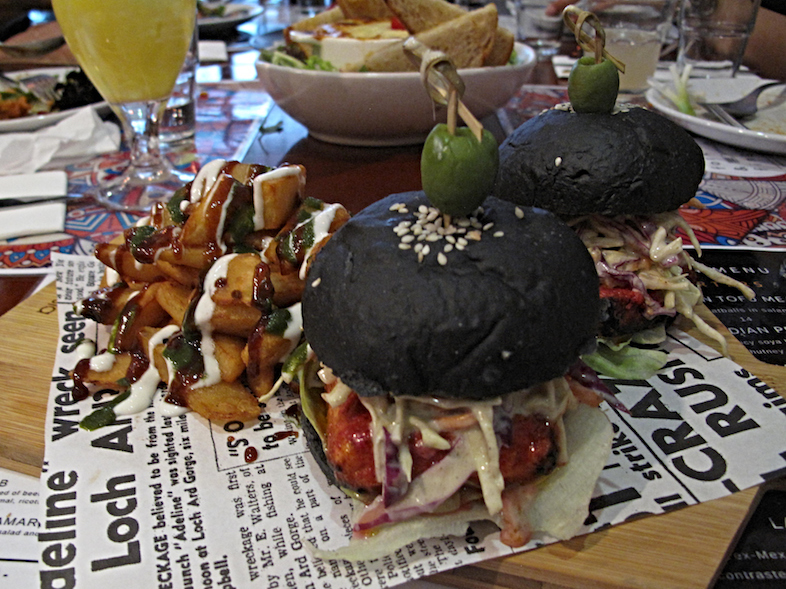 It also includes two types of chilli – crunchy crushed numbers and evil-looking black-red bullets. 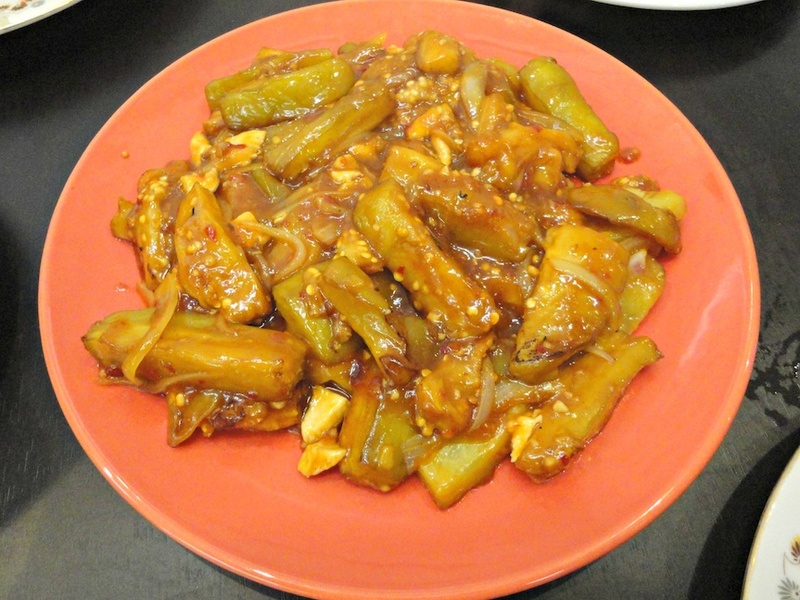 Spicy eggplant ($12.90) is every bit as good and equally chilli-hit, albeit in quite a different way. This number gets there through deep-frying the raw eggplant chunks and then whipping them into a sauce with chilli, vinegar and some tofu bits. 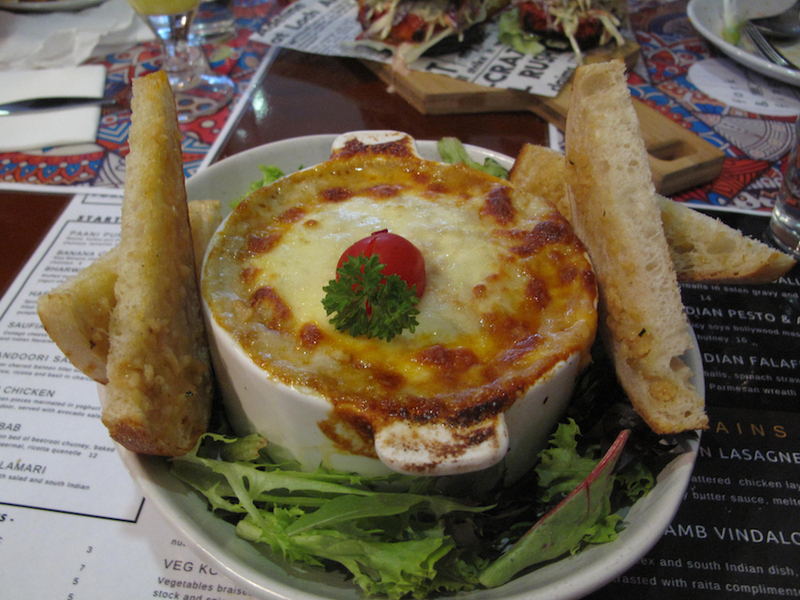 This dish was started from scratch for us – we saw the eggplant being peeled and chopped. 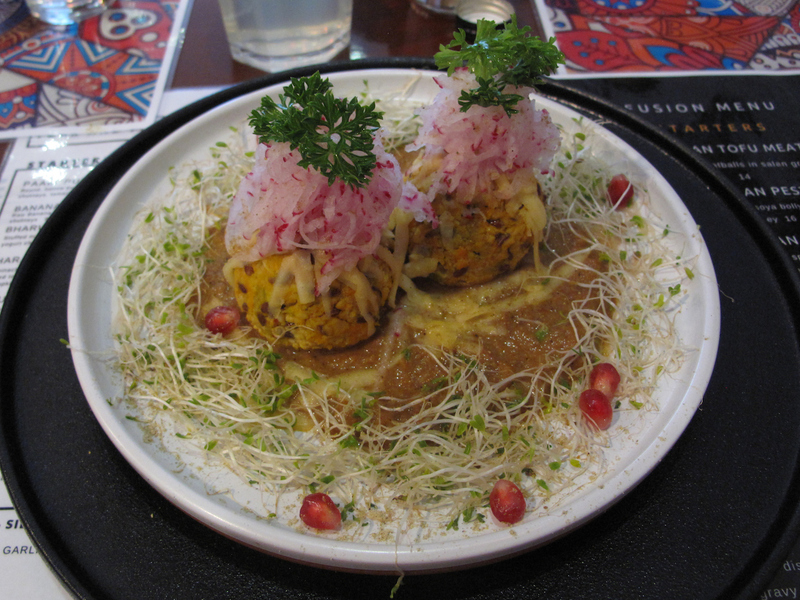 That such a fine dish resulted so quickly is some sort of magic, the eggplant itself displaying a deluxe lusciousness that beats even Japanese-style eggplant with miso or the slippery big pieces found in laksas. Perhaps there’s been a mono-dimensional aspect to our meal – chillies rampant in both dishes, both of which have been deep-fried. 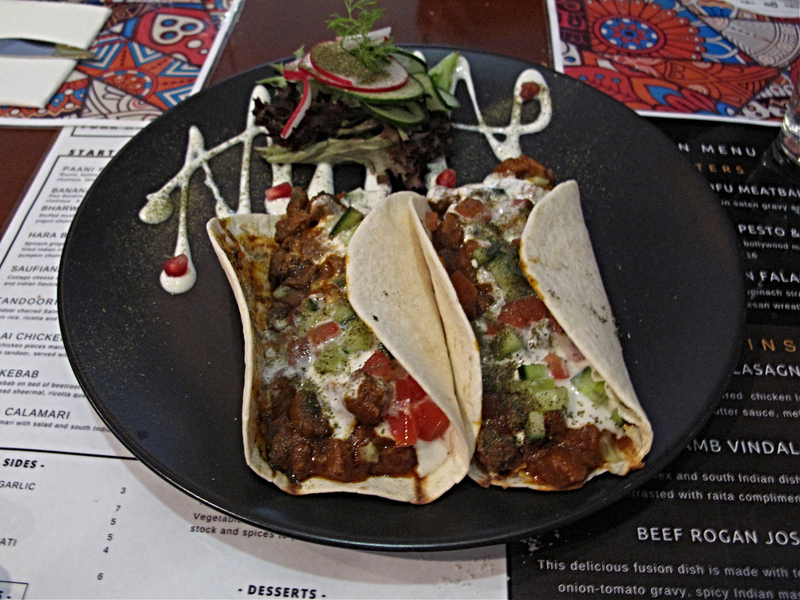 But the spiciness has been by no means close to our outer limits and both dishes have been ungreasy. 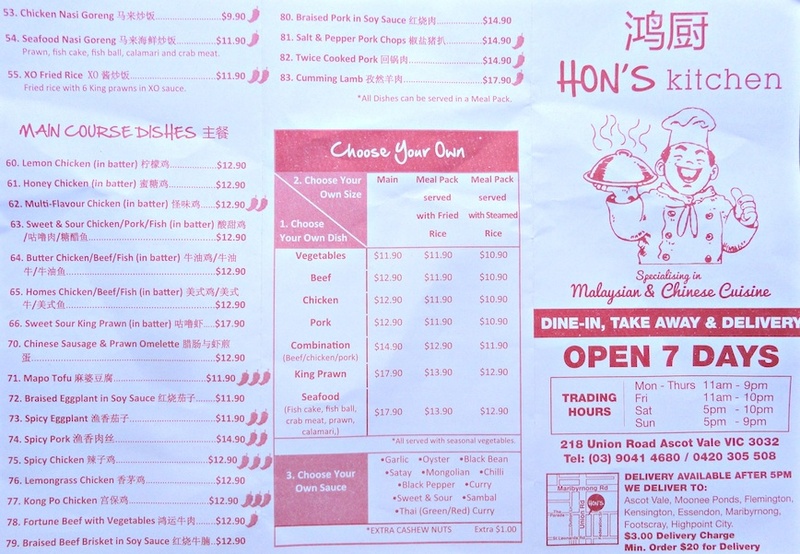 And while we suspect our selections are most likely among the least frequently ordered at Hon’s Kitchen, their outright excellence just adds weight to our belief that when it comes to Chinese food, some smart ordering at a humble suburban eatery can deliver eats every bit as great as anything to be found in your high-priced CBD palaces.